TheatreSquared’s Our Next Stage Campaign seeks to raise special funds to create Northwest Arkansas’s first permanent home for professional theatre and guarantee the future of this cultural and educational anchor for decades to come. With more than $21 million committed toward a $34 million goal, a broad cross-section of Northwest Arkansas has pledged their support for a shared vision of a landmark, permanent home for professional theatre in Northwest Arkansas. We invite you to join us and this community of arts patrons with your gift to the Our Next Stage Campaign—and help us to make this vision a reality. To allow for stretch commitments and donor flexibility, campaign pledges may be fulfilled in annual payments over a four-year period beginning in 2017. Pledges of $50,000 or more may be fulfilled over a five-year period. All contributions to the Our Next Stage Campaign are tax-deductible. TheatreSquared's staff is available to consult with you to ensure that however you choose to give—whether a direct contribution, gift of stock or securities, IRA transfer, Qualified Charitable Distribution, or gift of property—is maximally tax efficient. Please call Jamey McGaugh at (479) 445-6333 for more details. In gratitude for your support, TheatreSquared offers recognition opportunities to all Campaign donors — which will remain prominently visible as this new cultural landmark serves as a gathering place for hundreds of thousands of community members and Arkansas students for generations to come. Recognition opportunities are outlined below. TheatreSquared will honor Century Circle donors who have committed $100,000 or more by permanently naming a unique space in the new theatre center. From the artists’ apartments to the state-of-the-art theatres, these lasting, individualized opportunities are available throughout the center. Century Circle donors will also be prominently featured on the Campaign Donor Wall. Naming opportunities are available for review upon request, and include performance venues, rehearsal space, education and community space, production workshops, artist's residences and dressing rooms, individual and departmental offices, commons areas, outdoor patios and terraces, amenities (box office, coat check), and other unique areas in the theatre center. These named spaces will persist for generations of audiences and students who will pass through the doors of this new cultural landmark in Northwest Arkansas. To request a copy of our naming opportunities booklet or with other questions, please contact Jamey McGaugh at (479) 445-6333 or email jamey@theatre2.org. A singular feature of our region’s new theatre center will be the architect-designed Our Next Stage donor wall. This permanent centerpiece in the main-level Commons will contain the engraved names of each leadership donor in our Cornerstone Circle (gifts of $25,000), Founders Circle ($50,000), Visionary Circle ($75,000), and Century Circle ($100,000 and above). Century Circle members will also have the opportunity to permanently name a unique space. This visually striking donor wall is designed by international design award winners Marvel Architects as a lasting tribute to community members who have made this landmark theatre possible. 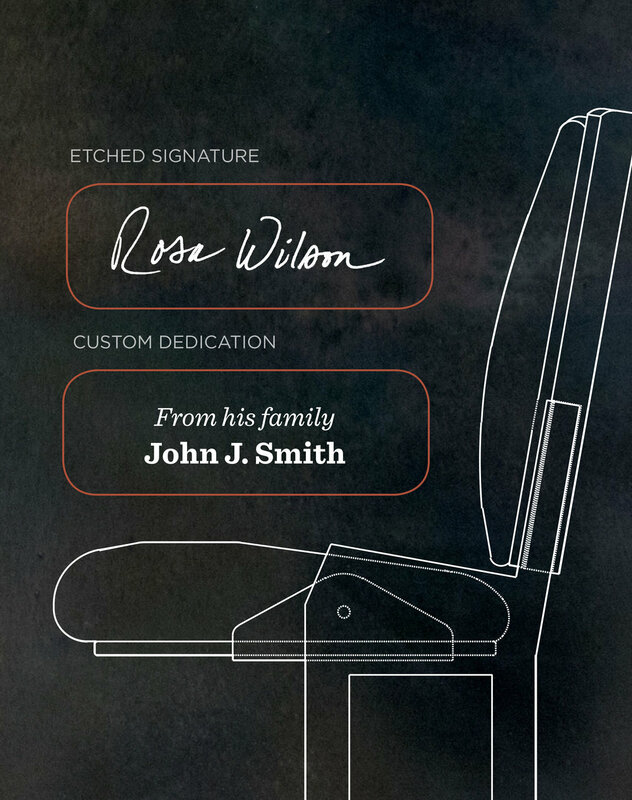 A seat dedication is a unique and heartfelt gift, whether you’re recognizing a loved one or showing your own commitment. Please note the opportunity to name a chair is limited, as there are only 275 seats in TheatreSqurared's intimate new mainstage theatre. Donors have the option of engraved letters or etching their personal signature on blackened steel on each of just 275 chairs in the mainstage. Our Next Stage donors who contribute gifts of $100 to $2,500 will receive special recognition on a two-page program spread for the full inaugural season in the new facility. To make your Our Next Stage commitment or with other questions, please contact Director of Development Jamey McGaugh at (479) 445-6333 or email jamey@theatre2.org.